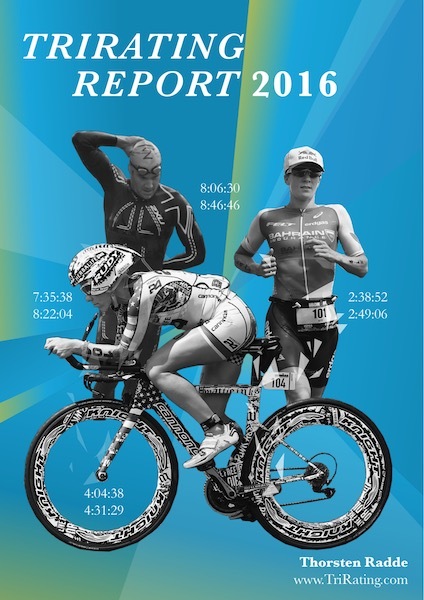 After Christmas I’ll be working on the TriRating Report 2016, my analysis of the results of at the 2016 Ironman-distance racing and interesting information about the athletes that played a major role in 2016. You can already pre-order it here (or use the link https://gum.co/2016RatingReport). 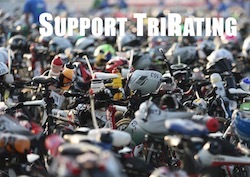 As a preview to the content of the Report, here are a few #TriTrivia2016 questions. If you have a problem answering the questions, I have posted my answers at the bottom of this post. As the fastest Ironman races this year are pretty obvious (and no one who was in Roth will forget them soon), who had the second fastest Ironman-distance races in 2016 (male & female)? Which North American athletes won an Ironman race in Europe or the Australian continent (Australia and New Zealand)? There are three “active IM three-peats” (one athlete winning the same Ironman race in 2014, 15 and 16). Can you name them (athlete, race)? Who overcame the biggest deficits in T2 to win a 2016 Ironman (male & female athlete at which races)? Who are the athletes with the most wins on the IM-distance and the 70.3 distance in 2016? Which were the closest 2016 IM-distance races (male and female winners at which races)? We saw a number of continental records (fastest times in an IM-distance race) this year. Can you name all four (continent, male/female, athlete)? In winning Kona 2016, where did Daniela and Jan post the fastest times for the individual legs (swim, bike or run)? The most successful long-distance nations are the USA, Germany, Australia and Great Britain. Who has posted the fastest 2016 IM-distance finishes (male and female) from each of these nations? Who posted the fastest marathons in a full IM-distance race in 2016 (male & female)? All the answers to these questions can be found in my TriRating Report 2016, available for pre-order here. and a ton of race results and all rated athletes! There are very few cases where a gap of more than 10 minutes in T2 was overcome to win the race. In 2016 there were two on the male side: Tim Van Berkel closing a gap of 14:01 to win IM Cairns, and Patrik Lange (largest gap by a male winner) had a gap of 14:50 when winning IM Texas. There were nine athletes that won two IM-distance races in 2016: Liz Lyles, Melissa Hauschildt, Marino Vanhoenacker, Mary Beth Ellis, Meredith Kessler, Patrik Nilsson, Jan Frodeno, Fredrik Croneborg and Jan Raphael. Only Daniela Ryf managed to win three (Challenge Roth, Ironman Switzerland and IM Hawaii) – all of them with a sub-9 time! The “winningest” athlete on the 70.3 distance of 2016 is Lionel Sanders: He won five races over the middle distance. With Heather Wurtele, Annabel Luxford and Andreas Dreitz there were three athletes with four wins. The closest female race was at Challenge Venice, where Erika Csomor won with 42 seconds in front of Martina Dogana. On the IM side it was IM Lanzarote, Tine Holst won with a margin of 2:18 over Alexandra Tondeur. NB: Blog reader Rob pointed out that Paula Newby-Fraser is also an African athlete. Though she was racing for the US in the latter part of her career, she won Kona a number of times racing for Zimbabwe. For example, she won Kona in 1992 in 8:55:28, and also finished IM Germany (at that time still in Roth) in 8:55:00. So Paula is still the fastest female African athlete! The fastest marathons in 2016 IM-distance races were by Joe Skipper (2:38:52 in Challenge Roth) and by Mirinda Carfrae (2:49:06 at IM Austria). That’s tough.. I remember four quite long “recoveries” for the Male Athletes.. Patrik Nilsson in Barcelona after the mechanical problems, Marc Duelsen in Wales, Harry Wiltshire in Vichy after Andreas’ “suicidal” bike ride and Tim Reed in Australia to catch Clayton Fettell. Not sure which one had the biggest difference..
No clue about the women to be honest. All of these had quite a gap, but the largest gap by a male winner in T2 was 14:50 by Patrick Lange in Texas. On the female side, the biggest gap was 15:45 that Kristin Möller closed when winning IM Sweden. I remember 2 male races that were close.. Malaysia a couple of weeks ago and France (Freddie and Victor del Corral I think won) both were within like 40 seconds or so and closer than Frankfurt. Your answers were quite close! For the females it was indeed Challenge Venice. On the male side Poznan (16 seconds) was a bit closer than Malaysia (33 seconds) and France (35 seconds). Germany (57 seconds) was also pretty close!